This entry was posted on Friday, July 20th, 2018 at 10:27 am	and is filed under Aviation. You can follow any responses to this entry through the RSS 2.0 feed. Both comments and pings are currently closed. I think someone (probably Dr B) knocked up a flight plan, using only one engine, flying slower than normal that met the expected endurance. ‘My overarching guess is that the overall ‘plight plan’ was to simulate a wounded bird. Thus any primary radar operater that actually noticed would perceive an unresponsive aircraft possibly heading towards the next available diversion airstrip. So, I don’t think the pijacker had a deep understanding of BTO and BFO however I do think he understood the fuel useage of his own plane sufficiently to have played us all. I welcome the new study. The “cat’s got my tongue” because I am less knowledgable re: drift models. Right now I tend to agree we need to check 20-25 South before going wide. You include a significant amount of drogued drifter data in your dataset. Griffin et al. showed that submerged items floating near the surface drift much alike undrogued drifters. There must be a clear difference in drift behaviour between drogued and undrogued drifters, as the latter category is much more susceptible to (direct) wind and wave effects. How do you account for the difference? That’s because such items are effectively “floating” i.e. their volume is still larger than the weight of the water they are displacing. Therefore, they are still subject to surface effects, though less in respect of wind, but to Stokes drift as per other floating objects. Well if the debris had taken such a direct path from the crash site as Richard Godfrey’s latest drift study suggests, there would have been thousands of bits of MH370 washing up on the other side of the SIO, since most of it would go in the same direction, hardly anything washed up on the other side of the SIO. No one will find any trace of MH370 searching further north, or even any where else on that 7th arc. Why not go back to the start, with the arcs which after the startup would have to be in the wrong place, with the search in the SIO which was in the right place before it was suddenly moved on March 27th 2014, and with where most of the debris actually went, because most of it never went any where near that 7th arc. What little amount of debris did cross the 7th arc, would have crossed in multiple places, as it was already spread out, before it crossed the arc. Back tracing debris to that 7th arc is not going to lead to the MH370 wreckage site, which is south, way south and not on that 7th arc. In order to accept your search area as valid, we’d have to dismiss the satellite data, the radar data, the drift models, and the fuel consumption models. That’s not likely to happen. …and the absence of debris in Western Australia. IMO, that is the “deal killer” relative to terminal locations farther South. Note I used farther instead of further. Ami would be pleased. So far as I am aware, none of the drift models showed any significant probability of debris washing up on the coast of Western Australia, regardless of start position on the arc, all the way down to 40S. I am not in the mode for arguing, but what I said has a strong historical basis. I am not going to dig out a bunch of references to prove my point. I discuss drogued and undrogued GDP Drifter Buoys on page 9 of the study. I do not find a significant difference in the drift speed between drogued and undrogued GDP Drifter Buoys from the historical data sets provided by GDP across a population of 96 buoys. Of the 96 GDP Drifter Buoys used in this study, 78 were drogued and 18 were undrogued. A drifter buoy that lost its drogue at its end point was classified as drogued. The average speed of all 96 GDP Drifter Buoys was 0.535 knots, whereas the average speed of the 18 undrogued buoys was 0.522 knots. The average speed of the undrogued buoys is 97.6% of the full set of buoys. For your information, Erik van Sebille has never published a paper on MH370. According to his CV, he has published 84 articles, given over 30 presentations and 60 seminars, but not a single one on the subject of MH370. What you are quoting is an opinion expressed in an interview for media. If I were to include a table of opinions in the paper, it would extend to over 1000 pages! Alec Duncan is also not the author of a drift analysis. He has investigated hydro-acoustic signals received and concluded they are not from MH370. Meteo France and GEOMAR are both included in my paper. However, GEOMAR has two favoured start latitudes on the 7th Arc at 15°S and 25°S, whereas I show there is a hard cut of at 18°S for all start latitudes between 18°S and 10°S. @Richard Godfrey: Not fully understanding the facts has never stopped her from making false accusations on Twitter. You are correct that there is not only a slight difference in the speed between drogued and undrogued drifter buoys, there is also a slight difference in drift direction. From 20.5°S on the 7th Arc, I show a track based on my mix of drogued and undrogued drifter data with an overall bearing towards Reunion of 277.2266°T ending up 699 km north of Reunion. From 20.5°S on the 7th Arc, using only drogued drifter data the overall bearing towards Reunion is 274.5383°T (2.7° less) ending up 453 km north of Reunion. From 20.5°S on the 7th Arc, using only undrogued drifter data the overall bearing towards Reunion is 279.4107°T (2.2° more) ending up 903 km north of Reunion. Over a distance of 5,059 km, these small differences add up. All of the above data does not account for windage of the Flaperon. When you factor in the windage, the speed and direction will change again. But Cat 3 and Cat 4 are somwhat inconsistent and therefore could plausibly be ruled out. Now although one can find reasons for Bad A, it is perhaps rather difficult for Bad B – in the sense that Good B could be a very significant event for survival but is insignificant otherwise. Therefore, once Bad B is ruled out, the only conclusion is that Cat 1 is the most likely event. @mash: There is no evidence that the IFE was inhibited at 18:25. In fact, there was a normal IFE log-on during the 18:25 log-on sequence. Please check the shaded band in the figure for African Mainland in Victor’s article on your drift study. It seems to be near +/- 150 days, not 50 days. I think what Victor depicts is the range of MH370 floating debris with known arrival times arriving on mainland Africa from 655 days – 50 days to 835 + 50 days. @DrB, @Richard Godfrey: Yes, Richard is correct. The text accompanying the chart says: Also shown by the shaded area is the range of times corresponding to the actual arrival of the engine cowling fragment and the outboard flap, again bounded by +/- 50 days. I had the same question as DrB, but I understand now. As a nitpick your choice of shading could be a bit stronger. I did work through the paper. Nicely done. I really like your time arrival versus latitude graphics. I take back what I said about shading. It is fine on my Mac (which I fired up for an unrelated reason). On a Chromebook it is difficult to pick up. I love the Chromebook, BTW. It is the future of computing IMO. Thanks for working through the paper and your kind comments. As you can see from the arrival graphs, either some items of MH370 floating debris arrived quite some time before being discovered or they were caught up in gyres farther away and experienced a further adventure. I’m trying to understand your methodology. Is it correct that you used the “mixed” (drogued + undrogued) dataset to represent the drift of submerged (low windage) debris, and the mixed dataset + windage effect for the flaperon? I put Pattiaratchi’s comments in the “what else would he say category”. I have much more confidence in Richard. The use of “Mr” Iannello in the article instead of “Dr.” Iannello could be regarded as a small oversight, but it still pisses me off. @mash: No, I’d say the most likely reason for the missing IFE log-on at 00:19 is either the APU ran out of fuel or the aircraft crashed. @Richard Godfrey, @DennisW, @David: It is not surprising that Chari Pattiaratchi and likely David Griffin disagree with a search area as far north as Richard recommends. And I agree that the CSIRO and UWA models do incorporate more accurate data at higher resolution. However, what Chari and David G do not address is why the plane could have flown so far from the 7th arc as they now propose to search. If the opportunity to search again presents itself, I don’t believe it will be easy to decide whether to search wider or further north. I’m still in the undecided camp, and I am willing to consider arguments for either approach, although I will say that at this point I am leaning towards searching further north. Prof. Charitha Pattiaratchi also fails to explain why the drift studies from Meteo France and GEOMAR disagree with his findings, but align with my findings. He doesn’t even agree with his Australian colleagues at CSIRO on the most probable MH370 End Point. “UWA Professor Charitha Pattiaratchi said last year that its reverse drift modelling put the location of MH370 “at Longitude 96.5 E Latitude 32.5 S with a 40km radius”.” – The West Australian – 23rd January 2018. His favoured MH370 End Point within a 40 km radius of 32.5°S 96.5°E has been searched out to 23 NM from the 7th Arc by Ocean Infinity. How he justifies searching out to 52 NM from the 7th Arc, especially when the ATSB say the flaps were not extended, I do not know. After searching 332,000 square kilometres without success, I would regard the ability to determine the MH370 End Point to within a 100 km grid as a helpful starting point for a new search. You ask “Is it correct that you used the “mixed” (drogued + undrogued) dataset to represent the drift of submerged (low windage) debris, and the mixed dataset + windage effect for the flaperon?” Yes. The software application that I wrote can interrogate various datasets (mixed, drogued only, undrogued only, with gyres, without gyres, with windage and without windage). You have to consider not only those two “most likely” events happened, but also happening at the right moment. American amateur investigator Blaine Alan Gibson, who has found numerous pieces of plane debris, has been urging the Malaysian authorities not to release a “final” report at this time. A report, he says, cannot be final until the plane is found and the truth is known. Gibson says there needs to be a full report about personal effects that were found on Riake and Antsiraka beaches in Madagascar. “Many pieces of debris that have been confirmed to be ‘almost certainly’ or ‘highly likely’ to be from MH370 were discovered on those beaches,” Gibson said. “We need to see the report on the investigation into these personal effects by the Royal Malaysian Police. Gibson also says the Malaysian government should make public the raw military radar data from the night of MH370’s disappearance so that independent experts can analyse it. He says he hopes that the Malaysian government and Ocean Infinity will decide to resume the underwater search in the southern Indian Ocean when the weather in the area permits, possibly in November. I prefer the use of the term “unpaid professional” rather than “amateur”. Likewise with volunteer activities such as fire and EMS. Unpaid service providers are not amateurs. It is a demeaning description, IMO. I am also convinced Malaysia is closing the book on MH370. It is hard to argue with that decision given the uncertainties associated with additional underwater searching. @mash: Sorry, but I don’t understand what you mean. I stated that the absence of the IFE log-on at 00:19 was likely due to either the APU running out of fuel or the plane crashing, i.e., the missing IFE log-on was caused by one of the other two events. Those are not independent events. @DennisW said: I am also convinced Malaysia is closing the book on MH370. Perhaps, but this investigation has been on life support for years now. I think we’ll know more by mid-November of this year whether there is a realistic chance of re-starting the search. I don’t think that Ocean Infinity has lost all interest. Many thanks for the clarifications and sharing the Excel file. As your “mixed” data set contains more data from the “drogued” category, I’m worried that the windage effects for the “non-flaperon” parts you consider in your analysis are not fully taken into account. Griffin et al. concluded that these parts would have an effective windage factor close to that of undrogued drifters (8/12/2016 report p. 9). The effective windage factor (dominated by Stokes drift) was estimated around 1.2% (same report p. 11) for undrogued drifters, in de direction of the wind. If indeed your “mixed” data set is dominated by the drogued drifter data I would expect a northerly bias in your estimates for possible crash locations (due to both speed and direction effects). Difficult for me to estimate by how much. Perhaps this can be repaired by introducing a windage factor for the “non-flaperon” items as well, however this would need a good understanding of the behavior of drogued drifters. Currently, for example, I find it difficult to understand the small difference in average speed between drogued and undrogued drifters which you have found in your data set. @Niels: The engine cowling fragment (“Roy”) found in Mossel Bay, South Africa, is interesting because it was the first part found after the flaperon, yet it is also took the longest path. It also would float fairly flat on the water, and therefore would have small windage. The starting latitudes proposed by CSIRO and the UWA really don’t explain the timing of finding this part. Although there is a limit to what drift information we can draw from one part, it would also be an error to ignore it. That means the second logon interruption, whether due to crash or APU failure, must be happening between those two parts; that is, within that 90 seconds after 0019:37. But the chance of the interruption happening in that 90 seconds is proportionally low; that is, why not an earlier, or a later, interruption time – considered as a probability experiment? @mash: We believe the last BFO value indicated a descent rate of 14,000 fpm and a downward acceleration of 0.67g. It would be no surprise if the plane crashed within a couple of minutes after that and produced no IFE log-on. For the Southern Indian Ocean, there are 204 undrogued buoys in the GDP Drifter dataset, launched after 1st January 2000, which lasted longer than 100 days at sea and where the drogue was lost between the launch date and a date 10% into the journey time. In other words, these 204 drifters were between 90% and 100% undrogued. It will take a bit of time, but I will build a database with these 204 undrogued buoys and rerun the floating debris simulation software for key latitudes between 10°S and 40°S. We will then be able to better see the difference between data derived from drogued and undrogued drifter buoys. The last BFO value indicates the descent rate. The acceleration at that time could have been downward or upward. we don’t know the value. Heat map shows how many NOAA buoys originated in SIO from the LAT LON 1°x1° for: Flaperon; Flap fairing, Tailstabilizer, Engine cowling, Wing flap and Mossel Bay debris to their place of finding (rectangle area +- 1.5°). The final heat map is a result of multiplication of number find buoys in given SIO rectangle 1°x1° for each debris. On April 04, 2014, I notified the Australian Maritime Safety Authority of a hypothesis that had the aircraft crashing in exactly this zone. Aerometrex also published the hypothesis on its blog, see http://www.aerometrex.com.au/blog/?p=901 . AMSA apparently took the theory seriously and started moving MV Ocean Shield to this search area the next day. The Chinese Govt also commenced searching in this area. The hypothesis is based on an assumption of the aircraft’s ultimate destination coordinate, and includes consideration of some, not all, eyewitness accounts as well as fuel burn, the initial radar tracking and the Inmarsat satellite pings. Unfortunately all of the data I had was gleaned from newspaper reports so I had been content to let the issue rest with the authorities, who presumably had better source data. However nothing I have seen since has convinced me that my hypothesis has been disproved, in fact the latest independent studies seem to support the hypothesis. @Gysbreght: The last two BFO values indicate an average downward acceleration of 0.67g over eight seconds, reaching a final value of 14,000 fpm. You know this. @Victor Iannello: Of course I know this. The aceleration is unlikely to have been constant during 8 seconds. I think it could easily change at the rate of 0.5 g per second in maneuvers, and hence could have varied greatly at the end of those eight seconds. @Gysbreght: You are once again arguing for the sake of arguing. Yes, we all understand the difference between average and instantaneous values. Any way you slice it, if there is an 8-second period over which the average downward acceleration is 0.67g, the flight dynamics are very unstable, and barring pilot input, a crash likely occurred soon after. That was the context of my comment to @mash. @Victor Iannello: You assume that the downward acceleration occurred without pilot inputs. @Gysbreght: Yes, a downward acceleration of 0.67g can be achieved without pilot inputs under some circumstances. As I said, “if there is an 8-second period over which the average downward acceleration is 0.67g, the flight dynamics are very unstable, and barring pilot input, a crash likely occurred soon after.” With pilot inputs after 19:41, the impact might have occurred farther than 100 NM from the arc, and over a large range of latitudes along the 7th arc, and it will be nearly impossible to define a manageable search area. I think the evidence of a rapid descent and an impact close to the 7th arc is strong. A pull out and glide is possible, but there is nothing to suggest that this maneuver occurred. For me, the rationale to search farther North greatly outweighs increasing the search width at latitudes already searched. The path towards the Cocos also makes sense relative to mindset (i.e. a possible last landing opportunity), and as a convenient LNAV weigh point. Implicit in my thinking is that ZS diverted the flight, there was no equipment failure, and suicide/murder were not the intended outcomes of the diversion. @DennisW: I agree that this scenario seems to best fit the evidence we have today. Implicit in this scenario is that something occurred which prevented the landing on Cocos Island. However, without more evidence, it is difficult to assign any level of confidence. It’s possible that new evidence or new insights will surface that either support or refute this scenario. The way I look at it, we have a (1) best case end-flight scenario (near Arc7/fidnable) and (2) worst case scenario (very long “glide” from Arc7/unfindable). I am thinking it makes sense to rule out Case 1 by searching, after that not sure. That’s much appreciated. It is important to find out, however, I understand it (again) requires a substantial effort. Meanwhile I will check literature for more info about the drifters / GDP. About the “Roy” part you wrote: ” It also would float fairly flat on the water, and therefore would have small windage”. In my (limited) understanding of the matter, one would still need to consider Stokes drift for such part. This is the major contributor to the effective 1.2% windage factor for undrogued drifters as described by Griffin et al.. This effective windage factor (multiplied by the wind velocity) has to be added to the surface current term that follows from an ocean model (V_5 in Griffin et al. 8/12/2016). My assumption is that this “V_5” corresponds approximately to what the drogued drifters will measure, as due to the depth of the drogue they will effectively experience very little Stokes drift. Perhaps this assumption is wrong, but then it would be important and interesting to understand why. I would like to ask which model/calculation you used to arrive at this conclusion. You are correct that ‘Roy’ was found at an earlier date than the model predicted. But to be fair, the model error is ‘just’ 2 months. I consider Roy’s arrival time – before anything else upstream – to be something that is simply too hard for any present-day model to convincingly explain. You’ve seen the paths that things take. But those paths should not be interpreted too literally. Our Dec 2016 report mentions that we do not have confidence in the model’s ability to hindcast the arrival times of individual items along the African shore. That’s why we focussed on the more-robust things that the model tells us. The timing and location of the discovery of Roy remains unexplained, and it was essentially ignored by CSIRO and UWA in favor of other metrics. NOAA buoys for heat map. 1. search result (so far not in narrow corridor of searched arc). 2. not too many, not too few debris beached. 3. experts’ arguments about state of flaps, flapperons, etc. 4. apparently no evacuation after glide. 5. potentially (and hopefully) more or less intact plane. 6. potentially shorter glide range for search purposes. @falken: I’m not a fan of the mud-slinging that goes on at that site, and anti-Semitism is a turn for the worse. However, let’s not cross-post, as it only infects this site. It appears to me that David Griffin made his remark (“You are correct that ‘Roy’ was found at an earlier date than the model predicted.”), in the context of a discussion about the possible crash location in the S35 area. Indeed, looking at the KMZ files, the first particles arrive in the Mossel Bay area 2 – 3 months late. However, for S32 as assumed crash location (as indicated earlier by prof. Pattiaratchi), the first simulation particle passes Mossel Bay already in the first half of November 2015. So to say “The timing and location of the discovery of Roy remains unexplained, and it was essentially ignored by CSIRO and UWA in favor of other metrics”, imo is quite a strong statement and to me feels a bit unfair, at least in the direction of the UWA team. Can you check your Twitter direct messages, would like to discuss something with you as regards MH370. Sorry about posting this Victor just wanted a chat with Bill. Does anyone have the co-ordinates at each time for the best path near straight and constant speed for the corrected BFO used in (hopefully ATSB used Ashton paper corrected BFO) from 19:41 to Bayesian central that ATSB used. @Niels: When you consider how few parts have been discovered, and how few of the many particles in the CSIRO simulation pass anywhere near Mossel Bay in that time frame (never mind land on the shores), the discovery would seem to be a low probability event (but not impossible). That’s why David Griffin said he preferred to use other metrics, i.e., “the more-robust things that the model tells us”. Speaking of other metrics, there is a sharp disagreement between David G and Chari P about whether the absence of discovered debris on the shores of WA can be used as a discriminator of starting latitude. David uses this to help pinpoint the latitude. Chari says the offshore current prevents debris that approaches WA from washing up on the shores, and therefore the absence of debris provides no discrimination of latitude. Would you know how specific prof. Pattiaratchi was when stating this (context / conditions)? It is hard to believe this would apply to all latitudes of WA coast, all seasons and all types of debris. WA coasts would be remarkably clean. Perhaps someone with local knowledge can provide some context / background? Pictures of WA beaches would suggest a ton of debris. Hard to believe it all got there from beach-goers. 1) The July 2015 arrival date of the flaperon at La Reunion island is consistent with impact occurring between latitudes 40°S and 30.5°S. 2) Arrival off Africa of other debris exclusively after December 2015 favours impact latitudes south of 32°S, as does the failure of the 40-day aerial search off Western Australia to find any floating debris. 3) Absence of debris findings on Australian shores is only consistent with a few impact latitudes – the region near 35°S is the only one that is also consistent with other factors. Chari strongly disagrees with David about the validity of statement of (3). Thank you for the links. A first quick read indicates that people dropping stuff at or near beaches is a major factor in the debris load. It gets redistributed by water and wind. Debris on WA beaches is a significant issue, at least near urban zones. One gets the impression that there is more debris leaving Australia into the ocean than the other way around. So far not much found about marine transport along WA coasts, however loads of references to check through the CSIRO links and documents. I have found these to be useful sources for information on ocean currents off the WA coast. What I can remember from going through the CSIRO reports is that a crash location around S32 to me looked consistent with their simulation results. Perhaps the discrepancy between UWA and CSIRO drift study results is less than the different conclusions / search recommendations would suggest. Thank you, Don. This looks indeed very useful. @Niels: Any theory that predicts an impact at those latitudes implies there was a glide away from the arc to a distance of 25+ NM, as OI seems quite confident that the detection probability was around 97%. That’s the part I can’t reconcile. And if it glided more than 25 NM, it could have glided more than 100 NM. And if it glided more than 25 NM, it could have glided more than 100 NM. Inmarset Analysis and Drift Analysis can be regarded as complementary tools. Say, Inmarset data to determine the starting point and Drift data to determine the shift. Like converting a 1-dimensional problem to 2-dimensional. In this way, one can search (non-linearly) the squares one by one according to priority (probability distribution). If indeed the detection probability is what OI indicated (I can imagine it depends on the terrain), then a longer lateral displacement imo should be considered as serious option. I understand and agree that we cannot and should not ignore the final BFOs, so this needs additional analysis and discussion. Currently, I don’t know how we could approach this, as it needs detailed knowledge and perhaps even testing of the systems and algorithms involved. For example, I’m curious to understand if the frequency compensation would work as we assume, towards extreme attitudes or flight conditions. @Niels: If we ignore the final BFOs, of the 10 Boeing simulations for the end-of-flight, the furthest point of impact from the 7th arc is about 14 NM (depending on the crossing angle between the plane’s track and the arc). If we accept the vertical speeds implied by the final BFOs, the impact point would be much closer to the 7th arc. A longer glide implies controlled flight after fuel exhaustion. If this occurred, a glide of about 120 NM could have occurred from a starting altitude of 40,000 ft. So if we want to conduct a search that includes the possibility of controlled flight after fuel exhaustion, how do you propose establishing the limits of the search width? I don’t think we should ignore the final BFOs. Also, I don’t think a long glide after a steep dive is a very plausible scenario. When I posted this morning I was thinking about alternative interpretation of the BFOs which would result in slightly farther impact point. However, there is also the lack of Satcom communication; is it correct it was expected about 1.5 minutes after 00:19:37?. @Niels: @Don Thompson knows when the IFE log-on was expected. I think it was around 1.5 minutes after log-on acknowledge, as you stated. If you believe there were no pilot inputs at the end-of-flight, the impact should have been within around 14 NM from the 7th arc, independent of the interpretation of the final BFOs. I don’t see how an alternative interpretation of the BFOs will allow you to conclude the impact was further. I hope Victor is correct (MH370 is close to Arc7), but I see possibility of longer glide than 120 nm if pilot wanted to conserve a some residual fuel, climb to FL400+, nose down and gain speed and ride the 70 knot winds with enignes on idle. Presumably IFE was switched off in this scenario. @TBill: I can’t say for sure the plane is close to the 7th arc. My point is that if you want to include the possibility of pilot inputs at the end-of-flight, you might have to extend the search area width to +/- 120 NM, especially if you ignore the final BFOs. If you exclude the possibility of pilot inputs, the impact should have been within +/- 22 NM of the 7th arc, and even closer if you trust the final BFOs. @falken: I suspect that the jeffwise.net site is hosted by Network Solutions, as is this one. My guess is there was maintenance or some other issue which made both sites inaccessible for a period of time. I was thinking about wrong pilot input, for example resulting in a stall and spin. (I’m still a bit uncomfortable by the large change in BFO within 8 sec just being captured by the log-on sequence). Not sure however how/if this could result in larger than 14 NM displacement. 1) The APU ran out of fuel, although there should have been fuel in the line to run longer. 2) The IFE was turned off after the log-on at 18:28. 3) The plane crashed before 00:21. I think the evidence lines up for (3), but we can’t be certain. I recognize lots of familiar names from Jeff Wise blog. My first time here. The assumptions for the DTSG model were based on a ghost flight which effectively only allowed long straight flights to be considered in the heat map. They assumed infinite fuel with post correction of the distribution. This ignored that the flight endurance is a separate problem from the route/range problem. This resulted in a primary zone between 40S and 35S on arc 7. The IO search extended in Zone 4 to 26S. This did not consider an active pilot with a clear plan to complicate any future search for the aircraft. It makes sense to burn off all of the fuel to minimize any surface slick at impact. A near vertical entry from an uncontrolled terminal spiral dive might have been the preferred entry versus a glide even for a live pilot. I would expect this would minimize surface debris. A pilot (with no understanding of satcom pings) would not want to go to maximum range at maximum endurance. Simplifies the search. It makes sense to engage in one or more large circling turns. Each turn reduces the range by 100 to 150 miles. No need for extreme range – too predictable. 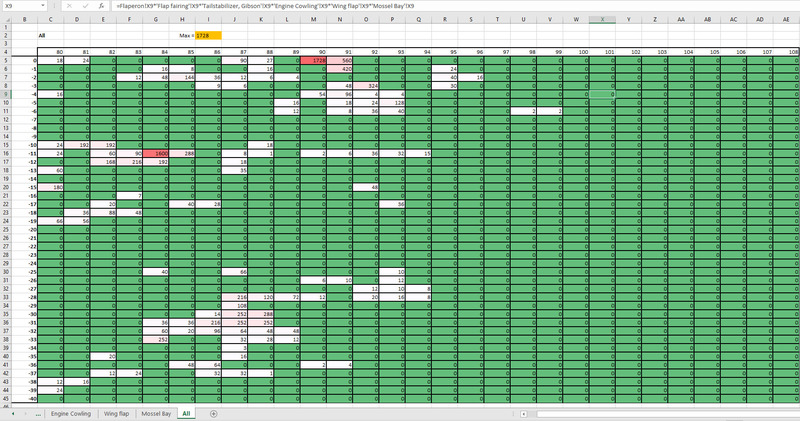 DTSG never modeled a heat map with, for example, one randomly placed planned standard rate circle. Then two. These “suicide” patterns were never modeled. They only consider a ghost flight. It would not surprise me that an enroute 360 turn or two could move the impact up above 25S as the drift models suggest. Depending on where a 360 turn occurs it could have a significant impact on the probably routes between arcs. An arc to arc segment that was evaluated by the model as not probable because it would be too slow would instead be very feasible. And this impacts subsequent arc-to-arc probable paths. A suicidal pilot would not know about the arcs so the idea of turning 90 degrees after fuel exhaustion would serve no purpose for complicating a future search. This is only useful if the horizontal entry was better than a vertical entry for debris pattern. I think a pilot would want a near vertical entry. But I would want to break up the range and endurance simulations which is easily done by a few 360 turns. @Hank: Welcome to the blog. We’ve been considering a holding pattern before 19:41 for some time now, which as you say, moves the impact point up the 7th arc. My last post considers a fully automated flight that ends near 22S latitude, and includes a holding pattern near Car Nicobar. Assuming that OI or somebody else wishes to re-start the search, the question becomes whether to search wider at previously searched latitudes, or to search farther north near the 7th arc. I’d say the jury is still out on that. Thank you for the response. I read your 7/20 article and the 6/8 article before I submitted my comment. The discussion in the 6/8 article of possibility 1 is very reasonable and I have no reason to question it. In my possibility 2 scenario, I assumed that the turns are AFTER 19:41 and would directly impact the arc to arc probability model depending on the location of each turn. A 360 before 19:41 would burn fuel and reduce range but would not mess with the arc to arc routing. Inmarsat used a very different approach in March/April 2014 to define the zone for the air search (25S to 20S) than Neil Gordon’s particle filter model used to define the zone for the undersea search (> 25s). Nobody reconciled the two models and $200 million was spent only on the basis of the DTSG work. The drift analyses seem to support the original Inmarsat modelling. @Hank: The DSTG model was based on automated flight after 18:02 with periodic inputs, with an a priori distribution for the number and interval spacing of those inputs. The DSTG model favored straight paths with typical cruise speeds and altitudes ending around 38S. On the other hand, the early flight path models (in April 2014) showed a turn at 18:27, paths over Banda Aceh, and slow, curving paths that fanned out based on ground speeds between 324 and 350 knots, and ending further north on the 7th arc (25S to 20S, as you say). We know the assumptions and rationale that were used in the DSTG analysis. We can glean from the ATSB’s final report some of the logic behind the path and speed assumptions used to construct the flight path models in April 2014. By 27 March 2014, following further analysis, the JIT had more confidence in MH370’s speeds derived by the primary radar data captured around Malaysia. The analysis indicated that the aircraft’s rate of fuel burn was higher during this segment of the flight than first thought and therefore its maximum range was decreased. The most probable track moved north to the S3 area and two new search areas designated S4 and S5 were defined (Figure 14). The corresponding drifted areas during this period of the surface search were areas A and B (Figure 15). We really don’t know what the JIT believed the higher speeds were, how much extra fuel was burned, and how they determined what the range of ground speeds to use in reconstructing the flight paths. It appears this work was not used by the DSTG when they reconstructed possible flight paths. On top of this, the BFO model was in a state of flux, as refinements were made to properly include the satellite frequency shift due to cooling during its eclipse. The preferred end point bounced around so much in this time period for various reasons that it’s not easy (for me, at least) to completely grasp the reason for each move. @Hank said: The drift analyses seem to support the original Inmarsat modelling. Which drift modeling? If you look at Fig 26 in Richard Godfrey’s paper, various drift studies predict impact points between latitudes between 38S and 12S. Now granted, the assumptions that were used in each model, such as windage, vary greatly. However, a cynical view is that a drift study can be cited to justify just about any impact point in the SIO. This statement is not just cynical, it is not true and misleading. It is logically impossible that all impact points along the 7th Arc are correct, let alone all impact points in the SIO. Fact is, that there are particular points along the 7th Arc that match a drift analysis and these have been subject of a number of drift analyses. My contention is that these drift analyses were all correct, but incomplete. It is easy, when you find one solution to a problem, that you do not look for a second solution or third or more. The impact latitudes near the 7th Arc of 34.5°S, 30.0°S, 25.5°S, 23.5°S and between 22.0°S and 20.5°S all fit one or more studies. The impact latitudes near the 7th Arc of 34.5°S, 30.0°S and 25.5°S have already been searched by Fugro or Ocean Infinity and can therefore be discounted to a 97% level of certainty. That leaves the area around the 7th Arc between 25.0°S and 20.0°S. Philosophically, I am in total agreement with you that there could have been intentional maneuvers. Those of us in that category probably preferred the original June_2014 ATSB model (which apparently had some errors) but the good thing was it assumed all flight paths from Arc2 were possible, straight paths as well as paths with turns. That approach fell out of favor due to errors, but also because there is a strong (but possibly wrong) argument that the BTO/BFO data tend to suggest a straight passive flight. @Richard Godfrey: When I said just about any impact point in the SIO, I was referring to impact points in the SIO along the 7th arc. I am deliberately playing devil’s advocate here. We can’t prove that a long, controlled glide did not occur. That leaves open a large range of latitudes, including latitudes already searched, but perhaps not sufficiently wide. As I said previously, I think the evidence lines up for an impact close to the 7th arc, which would suggest searching to the northeast of what was already searched. However, at this point, I can’t recommend this strategy with a high level of certainty. Perhaps new evidence will surface that will give us more certainty. 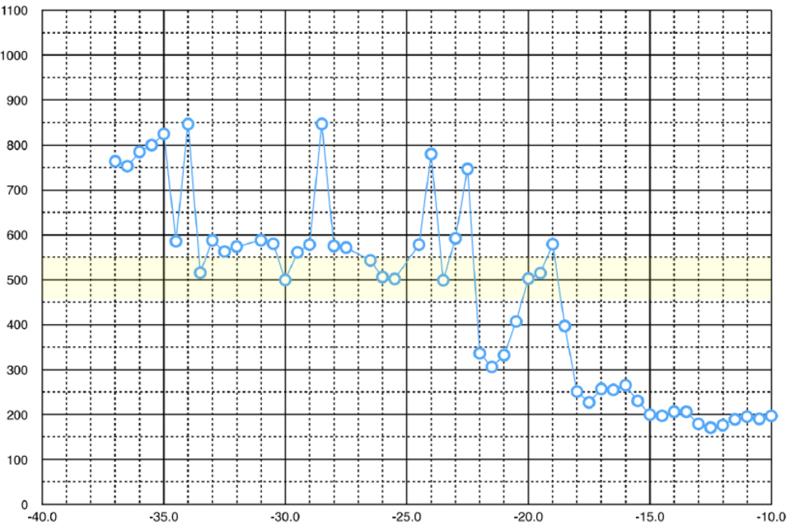 Firstly the BFO at 00:19:37 UTC shows that the aircraft was descending at a very high rate around 14,000 fpm. Secondly the ATSB examined the Outboard Flap and state it was not extended at impact. How is this evidence compatible with a long glide requiring a steady descent and partial flaps? I have now completed my new drift database and the results shift the most likely MH370 End Point to closer to 22S. The devil does not always pay his advocates. Sophisticated does not mean more accurate. Neil Gordon was a globally recognized expert in the Particle Filter method in UK before he moved to Australia to join DTSG. So it is not surprising that this method was selected and no other parallel approaches were used. But the method is only as good as the assumptions and I found many of the flight dynamics assumptions to be highly questionable in chapters 6 and 7 and section 8.2 of their book. I did reach out at the time to both Chris Ashton and DTSG but only heard back from Ashton. While Aston didn’t say it, my take is that DTSG pushed this strongly and parallel approaches were not taken. They used simple first order Markov models for speed, altitude, and heading changes with maneuver frequency modeled from airline flights. With many thousands of random flights, the filter would converge on long straight airline flights. And they calibrated it against actual airline flights. No zebras. So if a pilot actually performed a 360 degree clearing turn on the actual flight, they explicitly didn’t allow turns beyond 180, and the Monte Carlo approach set the probability of that route to close to zero. So the entire search was based on a routine airline flight toward the south pole. The Inmarsat approach was based on point to point mapping between points on neighboring arc segments where some are clearly not feasible – too fast. A segment that might be too slow may have been dropped, but could represent a 360 and maybe should not have been dropped. But Inmarsat was working with actual data for the flight. I have not seen any reconciliation of the two methods. In the final ATSB report the Figure 18 based on Inmarsat work shows air search boxes between 25S and 20S. Very different than the DTSG map on Figure 57 of 40S to 34S. A major fault with DTSG in 8.3 assumption 4 of infinite fuel. They clearly do not appreciate that the flight endurance is a separate problem from the range/route problem. They only used the particle filter to deal with routes and used some form of post processing to consider the known endurance. Maybe the PF could not deal with two related, but separate, objectives. I think DTSG did a great academic exercise for one scenario. I do not understand how $200 million could have been spend on such questionable assumptions with no alternate methods used or even any reconciliation of alternate methods. I wonder about the people dynamics between Neil Gordon and others. Since it was Australian dollars, Inmarsat had no incentive to push hard – and they provided the support for the satellite data. @Richard Godfrey: Even if we accept the validity of the final BFOs, a pilot could have gingerly pulled back on the control column and slowed, recovered altitude, and entered into a long glide. As for flaps, deploying flaps will actually reduce the length of the glide, as the (L/D) for the wing is reduced (although both lift and drag are increased). Flaps are not necessary for a long glide. The flaps will help if there was an attempt to ditch, which may or may not have occurred. I’m not advocating that a long glide after a rapid descent is what occurred, because my best guess is it did not. However, I am also not saying that a controlled long glide after a steep descent was impossible. I just view it as less likely than other possibilities. Given the complexity of the situation with currently no obvious path forward there is strong need for more and more accurate data. This includes all available radar data, data about previous flights as used by DSTG for their BTO/BFO “statistics” but also detailed info on the detection probability as a function of latitude. Some key latitudes (31.0 – 33.0 and 35.0 – 36.0) contain difficult terrain and I don’t like at all to draw any conclusions from some indicative number (97%). Without this additional data, most of which we know it exists, I wonder if it is possible to come to a responsible search recommendation. I applaud the new flight path proposals and Richard’s interesting drift study, however it doesn’t change the uneasy feeling that we are considering options which half a year ago would fall in the low probability category. @Niels: Yes, we all want more data. I also agree (if it is not already evident) that I am not yet ready to make a search recommendation. I also know that the subsea data is still under review. Perhaps when that review is completed, we’ll have a better idea of the detection probabilities. Maybe Malaysia will surprise us all and disclose new nuggets of information in the final report due to be released in several days. The average speed of the 78 drogued GDP buoys used in the study was 0.540 knots, whereas the average speed of the 204 undrogued GDP buoys was 0.622, which is 15% faster. The average track of the 78 drogued GDP buoys was 280.2°T. The undrogued buoys vary their transoceanic track by around ±8° compared with the equivalent drogued buoy’s track. These are general results for the Southern Indian Ocean and I am currently writing up the particular paths of interest from the 7th Arc to Reunion, Madagascar and mainland Africa. I introduced the term efficiency in my paper, defined as the point to point distance between the start and end points of a buoy’s trajectory, compared with the actual distance travelled through the water between the start and end points. The average efficiency of the 78 drogued buoys was 26.1%, whereas the average efficiency of the 204 undrogued buoys was 11.6%. In other words, undrogued buoys get caught up in the winds and waves and can vary their track much more than drogued buoys and are less efficient getting across the Southern Indian Ocean. I am currently writing up the results comparing the simulation of MH370 floating debris tracks based on drogued and undrogued datasets from various start latitudes on the 7th Arc and will publish them in the next couple of days. That is important and impressive progress. I’m looking forward to seeing the consequences for the floating debris simulations. As said before, based on direction and speed effects one would expect the estimated points of origin to shift south when using undrogued drifters, however with the lower average efficiency you’ve found I’m less certain about the net effect. @Richard Godfrey. There are some nice innovations in your drift study thanks (rate of advance ‘efficiency’ and the ‘go/no go’ gauges) though the tolerances of the gauges do imply a high confidence in the input data accuracy and interpretation. A specific. Earlier I have raised the likelihood that because the flaperon bore copious barnacles on the broken trailing edge (your fig. 4) that must have been mostly submerged en route and for some time, the barnacles being both large and small. Judging by their distribution the flaperon must have been almost completely submerged, presumably by water-logging. If so, given it would have more draft than ‘Roy’, the effect of surface water layer movement on drift should have been the lesser. With windage being little for both, flaperon movement might have been no faster – if not slower. Also, looking at your figure 19, the nil windage time for the flaperon would suggest an 18.7˚ starting latitude. At fig. 21, with no Reunion offset the start latitude would be 19˚ and fig.22 shows a ‘no windage’ fit with the required bearing at a 19˚start also. However were the flaperon representative of the average, 19˚ does fail the fig. 24 required spread ‘go/no go’ as it does the fig.25 split of tracks at Madagascar. So what I suggest is that the flaperon was without windage and its drift rate was like that of ‘Roy’ or slower; and also I raise the question as to whether its 19˚ start can be accommodated within the figs. 24 & 25 drift communities. If I understand correctly drifter “slip” (small for drogued and larger for undrogued drifters) has been removed. So, for drift studies of floating debris you would need to “reintroduce” slip into this data. I’ll try to find the pdf of Laurindo et al. 2017 as it could contain useful info on the different “slip” corrections. I’m searching for more info (papers) on drogued vs. undrogued drifters. d. distance from A to B (100 miles, say), possible to arrive B in 7 hours (if all forward direction). e. 7 hourly direction detection check-points. @Victor. The principal information sources as to where the wreckage might lie have been satellite data and drift analysis. A potential third has been from infrasound, hydro-acoustic or seismic detection of aircraft noise, an explosion or a crash. However, investigation of hydro-acoustic possibilities met with no success. Some work was done also on whether infrasound recordings by Comprehensive Test Ban Treaty Organisation (CTBTO) sensors during the initial search phase for the aircraft might disclose detections but likewise without success, and there was a later study of Cocos Island recordings in particular, again with no useful result. The above work was able and willing but piecemeal and scientifically compartmented. For example, investigation of hydro-acoustic recordings from Diego Garcia did not extend to local infrasound recordings. Also so far as I can see there has been no search through Indian Ocean littoral seismic recordings, yet seismic sensors elsewhere have detected small explosions and aircraft crashes on land plus at least one at sea. Moreover there has been no research into a fundamental, which is whether the crash of MH370 into the Indian Ocean SHOULD have been detected, bearing in mind that the kinetic energy of the aircraft at 500 knots would be the equivalent of 1.3 tons of TNT. That is well above the energy behind some long range hydro-acoustic and seismic detections made hitherto. While detection depends on more than just energy there does seem to be an opportunity here to gather more data. It might be found that at a crash energy level X there would be a high probability of detection proximate to and right along a 7th arc’s length of interest. If on further scrutiny of the relevant recordings of all sensors no evidence of a recording were found, that would suggest the ‘crash’ was of low energy, ie it was a ditching of some sort. On the other hand were a detection disclosed, obviously that would benefit future searching greatly. I have posted severally about this on JW, where discussion about infrasound originated, much of that being encapsulated in the last two. These are now attached below in case of interest here. @David: The infrasound work done that was pursued by LLNL could be interesting if continued. They found that the infrasound sensors could not detect takeoffs and landing at Cocos Airport. It would be interesting to use historical data to know if flyovers are detectable with high reliability. If so, and nothing was detected in timeframe of MH370, it would eliminate the path I proposed in the last post. If on the other hand, flyovers are not detectable, the path remains on the table (for now). Independent of infrasound detection, I wonder whether there are any recordings of audible ambient noise on Cocos Island in the time period of MH370. If an airliner flies over a sparsely populated island, it would be heard. Perhaps the audio was picked up by security cameras or other devices with a microphone. Admittedly that’s a long-shot. Increased scrutiny of seismic and hydroacoustic data from the CTBTO sensor network related to a crash is another avenue to pursue. I suspect what has been reported previously on gravity waves, as well as the seismic detections emanating from the South China Sea that were reported by the Chinese (and corrected by the US) used all of the relevant data. If we knew for sure that a high speed crash should have been detected but was not, that would be helpful information. Over on Reddit MH370 (Air China thread) I have recently posted news reports from 2008 and 2012 detailing seemingly similar Ryanair loss-of-pressure incidents compared to the recent 2018 incident. We assume different aircraft but apparently all 737-800. Of these 3 incidents, the 2012 incident is only one we can find a cause report, and it was reportedly due to two faulty cabin pressure controllers, whereas one new pressure controller was installed improperly before the flight in an erroneous attempt to fix the problem. Before I jump to conclusions, it would be nice to learn the cause of the 2008 and 2018 incidents, because they look most similar re: ear injuries. OK I jump to conclusions anyways, and that is the implication that opening the outflow valves is very effective way to rapidly depressure aircraft. I have a few questions I’d like to ask. The first question is about the data that has been used to calculate the ‘likely’ position. On average, what Indian ocean surface speed did you use for your models? And where did you get that information from? I mean, I don’t know for sure, but I believed I read something about the GDP. But I failed in finding the data on their webpage. My second question is about the ‘position’ of the aircraft. It’s position, I believe, is not in line with the data provided by Inmarsat. Do you believe they were wrong about the finding place after all? Briefly the Inmarsat data only tells us that the aircraft landed “near” Arc7, which extends from 40 South up to maybe about 10 South which is an arc of approx. 2,500-nautical miles. If you are referring to Inmarsat’s example flight path in their JON article, that was just one example (guess) of unfortunately an infinite number of equally valid flight path guesses that meet the requirements Inmarsat Arc rings. The aircraft speed for flight pass guesses ranges from high speed to low speed. When you propose a flight path, you know the distance between the Arcs and that sets the speed for your particular flight path proposal. @Victor. Thanks for your response and the deletion. I will ask the Centre for Marine Science and Technology at Curtin University for any more background it might have though I will await tomorrow’s final report. Besides what might be in it the likes of Curtin might be freer to respond once this investigation is finalised. More generally it will be interesting to see whether those numerous businesses and organisations involved in the investigation and bound to confidentiality during it then feel they are released from that once it is concluded. I am still wondering why there was not a third satellite phone call after the first two unanswered calls. Presumably the first two calls indicated the plane was still intact (by deduction definitely not crashed, if not still flying), And if still flying, why not make a third call around fuel exhaustion time to check ‘new’ status? Assuming the second logon was completed successfully, any calls before the next/last unsuccessful handshake should be in the Inmarset log. So there could be, or could be not, a phone call after 09:15; but definitely not before that. Thus the first party to know the plane was still intact (if not flying) is the party that made that second call, not Inmarset a few days later. So why the apparent discrepancy between the search effort/area and the available ‘phone call’ information in the first few days? Perhaps one can deduce ‘something’ from these ‘strange’ acts. By the way, while the ([last] FI) report suggested the calls were terminated by the calling party, both terminated after exactly 2? minutes; perhaps this is just a system constraint, but perhaps not? MAS operations chief did say they presumed MH370 might still be in the air. He did not say why they made that assumption. So MAS made the 23:14 telcon just a few mninutes before the 23:24 MAS press statement announcing that Flight 370 is missing. Note that the planned arrival time in Beijing was earlier about 22:30. Presumably MAS did not have too much opportunity for quiet reflection of options at that hectic point. 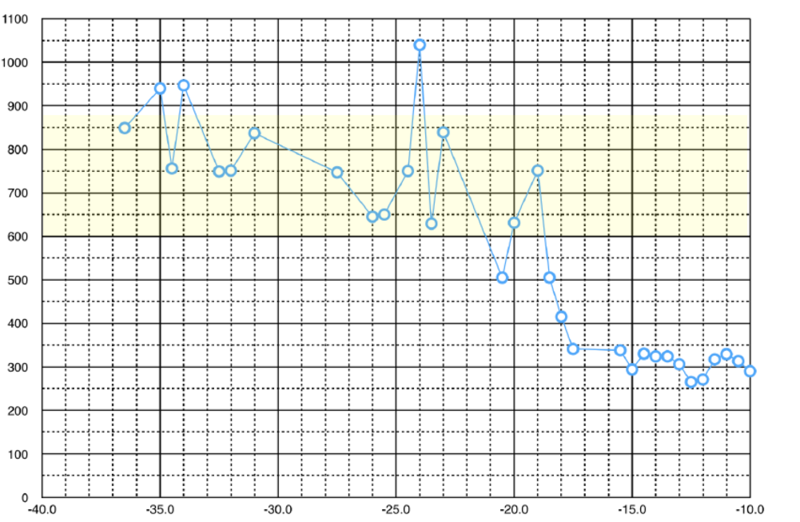 I have the initial results for 10 start latitudes on the 7th Arc between 18.0°S and 37.5°S. I have compared the previous results based mainly on data from 78 drogued buoys to the new results based on data from 204 undrogued buoys. 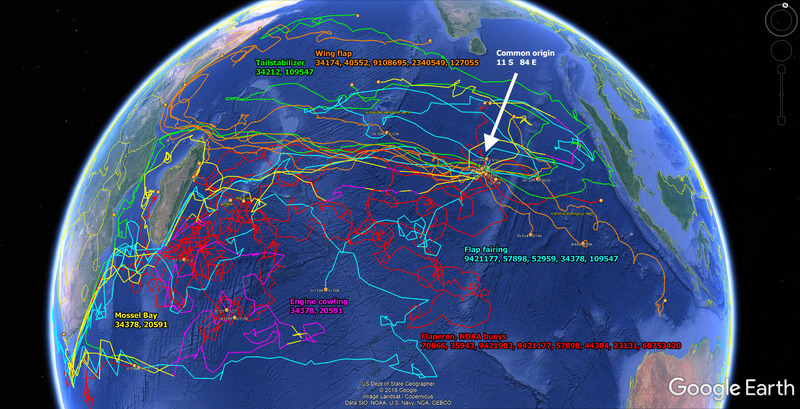 The simulated tracks of MH370 floating debris for start latitudes of 18.0°S and 21.0°S passed to the North of Madagascar to end up in Tanzania or Mozambique. 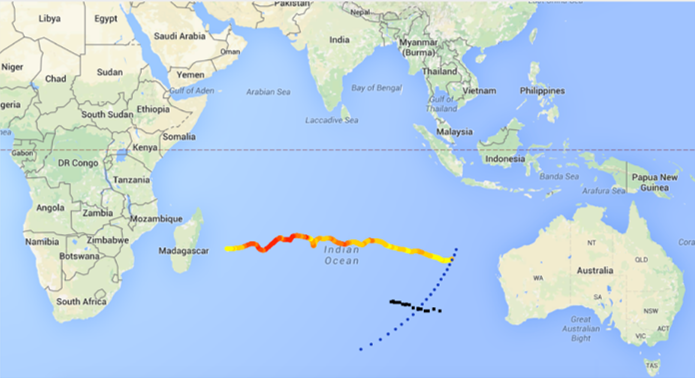 The simulated tracks of MH370 floating debris for start latitudes between 21.5°S and 37.5°S passed to the South of Madagascar to end up in South Africa or Mozambique. The switch from going around Madagascar to the North and going around Madagascar to the South is for a start latitude between 21.0°S and 21.5°S based on undrogued data. The result based on drogued data was for a start latitude between 20.5°S and 21.0°S, so this cross over point has moved slightly southwards using undrogued data. With the benefit of hindsight, I conclude that the MH370 End Point must be near the 7th Arc between 20.0°S and 25.0°S, with a hot spot around 21.5°S. Many thanks for all these additional efforts. It is not only important in terms of results; it also helps us to get a feel for the complexity and possible error sources in drift modelling more in general. 1. Drogued drifters data set? 2. Undrogued drifters data set? Thanks for the CNN link…I think I was watching CNN that night, and I was trying recall what they said and when. I think CNN coverage was very good up until the day about 2 weeks in, if I recall Richard Quest said CNN was not going to consider the pijacking theory for moral reasons. I would like to find that clip too. To me that was the day CNN deviated from searching for the truth. It is interesting MAS saying they had no idea where MH370 was, which at the time seemed so inadequate, now it seems very accurate. The initial results posted earlier today were without any compensation for windage. If I understand Griffin et al. correctly, for the “drogued” dataset you would need to add the 1.2% of 10m wind (downwind) + 10 cm/s left of wind. For the “undrogued” dataset you would possibly only need to add 10 cm/s left of wind, as the 1.2% of 10m wind effectively is incorporated in the “slip” of the undrogued drifters. As we now know, based on Laurindo 2017, the 1.2% is a crude estimate, as the Stokes drift most likely is not a simple function of local and momentary wind. My understanding is Griffin says that the Flaperon has a track with windage equivalent to an undrogued buoy plus 10 cm/sec plus 1.2% of wind and a bearing on average of 16 deg left of wind, but I stand to be corrected. You have to work out the drift vector and the windage vector to obtain the track speed and bearing. An interesting check would to add 1.2% of 10m wind to the drogued data (and nothing to undrogued data) and then calculate days to African coast. This should give two similar lines when plotted as a function of starting latitude. For the flaperon: I will reread Griffin, I think it is in the 13 April 2017 report (part ii). See for example at the sides of fig. 3.2. Please check sections 2.3 and 3 from the 13 April 2017 CSIRO report. According to the caption of fig. 2.3.1., the total leeway is defined with respect to drogued drifters (which I think are assumed to represent the “current” near the surface). The 10 to 20 degree angle to the left of the wind is applied to the “extra” leeway velocity for the flaperon (see caption fig. 3.1), which I think refers to the constant 10 cm/s term. This is confirmed by the text at the right sides of the panels of fig. 3.2. It could all have been written down a bit more clearly..
Perhaps it is wise to do a final verification with David Griffin? @Niels: I agree with your interpretation. The drift of the drogued drifters represents the surface current. Modeling the undrogued drifters require an extra 1.2% windage (aligned with the wind) due to Stokes drift (wave action), which is consistent with floating objects with little leeway. To account for the extra leeway of the flaperon, in addition to the 1.2% (aligned) windage due to Stokes drift, it requires 10 cm/s at an angle to the left between 10 and 20 degrees. To account for the extra leeway of high windage objects like seat cushions, a value of 3% windage is used, i.e., 1.8% higher than low leeway objects. The French report on the flaperon concludes that it likely came off on impact with the water rather than through in-flight separation. Although the latter can not firmly be excluded, it therefore looks like that MH370 did indeed try and ditch on the ocean. So who was this third party? How can they ignore that the captain had the best opportunity and capability to divert the plane? How does the timeline of the diversion fit any other possibility if the diversion was intentional? How can the captain’s simulator data be so casually dismissed as normal? Good that we agree on the different windage terms; Victor, thank you for the clear summary. A minimum (as I understand it all is a lot of work) would be to have c. in addition to a.
I have suspected for quite some time from prior public comments that the report would try to say unknown 3rd party hijackers, and I have speculated out loud about that in prior posts, probably a year ago. I need to try to recall what prior public info gave me that inclination. If you are correct (about ditching) that is obviously a big conclusion. Unfort it does not bode well for finding the aircraft. @TBill: If the plane was in a controlled glide after fuel exhaustion, there is little hope of finding the plane in the near future. The conclusion about the ditching event is my own; but there is no other conclusion possible given the relatively good state of preservation of the flaperon. In a high speed impact, that thing would be shredded. The French analysis all but excludes the possibility it came off in flight because of flutter. They are confident it came off on impact. The only constraint would be that the plane came down apparently not in landing configuration as it ran out of power, and the other wing pieces suggest the flaps were not down. Taking into account also the final BFO transmission, it looks like the plane first descended steeply but was later recovered, presumably to avoid a debris field. This would somehow constrain the length it could have glided from the seventh arc. The conclusion section (pages 25-29) seems to be critical of Boeing for not providing data. That is strange, but not unlike the French. It appears that Larry Vance was correct. The damage to the trailing edge was likely done by contact with the water. This is not the conclusion I was hoping for. An inflight separation would reinforce the conclusion of a high speed impact close to the 7th arc. My link does not work either. I suspect it is a problem with the way this site handles URL’s. You have to copy/paste the link into your browser. The .pdf needs to be included in the link. The analysis of the crash implications of the recovered parts has been sorely lacking to date. The French have finally provided something but the rest are still largely crickets other than pictures. Would be a useful endeavor to have all the parts in one room with crash experts and see what/if they would say about the nature of the damage and what it may mean about final flight. I disagree with that part of the flaperon conclusion which says that the flaperon must have been ‘extended’ at impact. I believe that impact of the airplane in a nose-up attitude could have caused the observed damage pattern. Any pilot would know that if they wanted to successfully ditch, they need to do it before they run out of fuel. Without engine or APU power you cannot extend the flaps and you need a certain degree of flaps to ditch. Either way, the flaperon damage indicates human input at impact. I think Larry Vance was partially correct. The flaperon came off on contact with water, but not in a high energy impact; however, none of the flaps were down to prepare for that ditching, and there was no power available anyway to bring the flaps down. If the BFOs are also understood correctly, then the first stage of the descent was either uncontrolled or akin to that. A bit like has been suggested by Simon Hardy in the 60 minutes documentary. Sounds vicious. I have no idea how to explain that particular end of flight scenario. There’s some suggestion in the report that Z. purchased ‘overseas’ painkillers (sedatives? ), which might explain that seemingly crazy end of flight behaviour (and also the blurred but relaxed speech during radio transmission, like ‘Malaysian errr 3-7-0’ and the one repeated confirmation of altitude). I think it would be fair to say that the Malaysian authorities have finally released the French report. The latest Malaysian Report contains some interesting information about the barnacles found on the Flaperon. On page 1318 in the appendix they state “By extrapolation, the colonisation of the larger specimens (36 mm) on the flaperon dates back 476 days (Figure 6)“, the Flaperon was discovered after 508 days. Further details are that the sea water temperature at the start of growth of these larger specimens was 28.5°C ± 1°C and at the end of growth was 25.4°C ± 1°C. Bhupendra Patel also found that the optimum water temperature for barnacle reproduction and growth was between 19°C and 25°C. The rate of reproduction was slowest at 19°C and increased as the water temperature increased toward 25°C. There was a marked cut off in reproduction at water temperatures above 25°C. A sea temperature map of the Southern Indian Ocean shows that only a start latitude between 19.0°S and 23.0°S matches a track starting in sea water at 28.5°C ± 1°C and ending at Reunion in sea water at 25.4°C ± 1°C. Red is above 29.5°C and too hot, Dark Orange is 27.5°C to 29.5°C and good for the start of growth, Light Orange is 18.0°C to 27.5°C and good for continued growth, Yellow is below 18.0°C and too cold, White is no data. Re the painkillers – see my post on the previous thread re a ‘fugue state’. It seems to read that way, which leaves me flummoxed as to why the emergency locator beacons did not work. I have yet to read those sections of the report, however. @Richard: I’m completely buffled about the barnacles. Their conditions of growth and living are known for decades probably and now this report comes up with the idea that they lead to a probable crash side between 19 and 23 degrees. So start searching there. I couldn’t open the above until I reduced it to http://mh370.mot.gov.my/,at which point I found myself on the Malaysian site, http://mh370.mot.gov.my/appendix.html. This lists eight Appendices, with links to others. If you click on APPENDIX, 1.12A-2, the French flaperon report duly shows up, but instead of a 4p translation, I found all 94 pages to be a “courtesy translation.” Interestingly most of them are marked, RESTRICTED CIRCULATION. Appendix 1-12A-1, also French, and marked HIGHLY CONFIDENTIAL, has 16p that are in English on and off. Mostly legal identification of flaperon material. 2.6B is a 50p flaperon ‘DES VALVES’ REPORT entirely in French. 2.6A is an 11p flaperon BARNACLE REPORT entirely in English. The rest are mostly older papers, and things of lesser interest. You want to copy and paste the whole URL, including “pdf”, into your browser. Then go to p. 28 of the pdf (actually p. 25 of that report) and start reading on the bottom of the page. I read the opposite in the report. The medical record showed that Z. occasionally took analgesics for his back pain, but there was no evidence of regular local or overseas purchases of over the counter pharmaceuticals. “Scrutiny of his credit card transactions failed to reveal a pattern of regular purchase of over-the-counter medication of any significance, either in local or overseas pharmacies. The possibility that such medication may have been purchased by cash cannot be excluded. My understanding is that he was prescribed pain medication for his back, but did not use his credit card to pay for this. He nevertheless used pain medication (not saying he regularly used any). The inference is that he normally purchased medication with cash, and that, therefore, the exact nature of the purchased medication is not known. If there is no relevance to this whatsoever then I find it doubtful that the report more than once mentions possible purchase of medication with cash. On p. 18 the report also mentions general issues with ” Flight crew medical and training records”. This is probably just a long shot, and I might be talking rubbish about the end of flight scenario but is there anything possible where a Squall updraft sometime after 00:1937 could make an airliner while in high descent as predicted go close to horizontal making it travel further from the 7th Arc? Between 1724:57 UTC [0124; 57 MYT] to 1737:35 UTC [0137:35 MYT] the “blip” (a spot of light on a radar screen indicating the position of a detected aircraft) made heading changes that varied between 8° and 20° ,…. Heading 273 parallel to M765? heading changes of 8-20 degrees – give us a clue, plus or minus, from what? It’s a shame that nobody bothered proof reading. Again your supposition, not proven fact! Why be open about analgesics in your medical examination and hide overseas painkillers or sedatives with cash payments? Just like the Flaperon. The report says significant damage and you say hardly any damage. Your supposition is a soft ditching, not a proven fact. To avoid a fire at any price? Laymans question: how much aviate control was left after flame out? I didn’t write “soft ditching” in the above, in fact, I ruled that one out. Sure, there is “significant damage”, but the whole thing is still basically one piece. It is not shredded into very small pieces, which obviously would be the case in the event it crashed into the ocean in an uncontrolled (near supersonic) dive. This can be firmly ruled out. I didn’t say “hardly any damage” either. What I wrote is there for anyone to see. @Coubert: To maximize the probability of a successful ditching, a pilot would want to minimize airspeed and vertical speed at the time of impact. Lowering the airspeed means increasing the lift characteristics of the wing, which is accomplished by lowering the flaps. However, lowering the flaps also increases the drag characteristics, which increases the downward vertical speed, i.e, the descent rate. The upshot is that a powered descent with flaps down is the best way to minimize airspeed and descent rate. You say ‘My understanding is that he was prescribed pain medication for his back … ‘. 2. “There’s some suggestion in the report that Z. purchased ‘overseas’ painkillers (sedatives?)”. I disagree with your conclusion and your suggestion. The report states “The significant damage was appraised for the purpose of determining a scenario for separation of the part from the aeroplane.” Appendix 1-12A-2, Section 12, Conclusions, Page 29. “Significant damage” is not a “relatively good state of preservation” as you purport. “He (PIC) was certified fit to fly in mid-2007 and went regularly for his six-monthly medical examinations for his continued licensure as a pilot. For his pain he was noted to have taken analgesics on an irregular basis. Based on available information, he was not on any regular long-term medication for any chronic medical illness.” Main Report – Section 1.5.9 – Page 36/37. he was noted to have taken analgesics on an irregular basis.” (pdf, 39). This means he was not on long term medication, but on medication on and off. My point was that the FR (final report) clearly states that he did not purchase any of these with his credit card. It is therefore implied that he did purchase medication with cash, and that therefore the nature of this medication is not known. If (!) this was pilot suicide – and I am not the only one who has ever said that this might be the case – then it is a reasonable assumption that some form of medication would help coping with the peculiar nature of that specific flight, including seven hours of flight after diversion. This could also explain why a) radio transcript section 4&5 appear blurred (Malaysian errrr 3-7-0, repeated cofirmation of altitude) b) the FO was pilot flying on his first flight without additional trainer. Is this a quote mining exercise? “relatively good state of preservation” in context is relative to the alternative assumption of an uncontrolled high-speed crash onto the ocean. It is simply impossible that the flaperon would be in the shape that it is know (i.e. still in one piece). There can be no doubt about this. The French analysis is similarly confident that the flaperon did not come off in flight (during an uncontrolled descent), at one point they use the words “definitely eliminated”. Pretty clear to me really. I wouldn’t call it a soft ditching. I agree with Victor that the purpose was hardly to achieve a “succesful ditching” given the unlikelihood that the aim of the end of flight was to survive, if indeed this was a suicide flight. Along with the ATSB conclusion that the flaps were not down, that leaves the only possibility that the aircraft was recovered and glided, but without proper landing configuration (after running out of fuel). One possible explanation I could imagine is that the pilot flying (whoever it was and whether or not they took medication to cope with the situation) recognised that there was one more satcom transmission and therefore went on to recover and glide rather than crash the plane, seeing that the satcom transmission might supply some data for future recovery efforts. What would be your alternative explanation of the French analysis. I’m curious to hear. The 777 has a Ram Air Turbine (RAT) which is a small windmill device that drops on a stalk from the side of the aircraft. This generates electric power for critical systems when the engines and APU are not operating. I think it deploys automatically, but I do not know for sure. This keeps critical flight instruments up and provides hydraulic power to certain of the primary flight control surfaces. But this does not provide power to operate the flaps. “Successful” ditching would normally mean getting the aircraft down on the surface of the water with structure intact so that passengers could evacuate into rafts. Clearly a powered,full flap approach seems preferred for this. But to get a “clean” low speed entry under the water, it may be OK to get maximum range by descending at the best L/D for a clean 777 (250 or so knots). Then level into ground effect to slow down and then dump the nose into a wave. I don’t know the lowest speed in ground effect that a zero fuel 777 can achieve. What is the best way to submerge a 777 to minimize surface debris?